2¼", 5", 7¾" & 10½"
Limestone is a sturdy material that can add organic beauty and character to almost any style home. The neutral color palette of Berkshire Stone Veneer allows this classic Indiana limestone to blend with existing trim and other materials such as wood, concrete and brick. The combination of light and medium cream tones with a touch of warm brown keeps the finished product looking elegant and refined, yet earthy and organic. 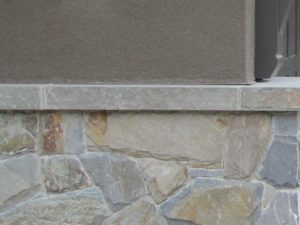 This product has a traditional ledge stone profile with a split face that exposes some raw edges for greater texture and dimension. It is available in 2 ¼”, 5”, 7 ¾” and 10 ½" face heights each of which are sold individually. The stone lengths range from 8" to 40" with typical sizes between 10” to 24” lengths which may contain some longer pieces. Applied to exterior elevations, Berkshire Stone Veneer creates a pleasing harmony across an entire home. Especially when used on half walls or on eaves, porch columns or porticoes. It can also be used to highlight features such as the front entrance way, feature windows and other architectural details. Berkshire Stone Veneer is also effective for lending coherence to landscaping plans. With the recent interest among homeowners in developing outdoor living spaces as a way to add value and enjoyment to their residential property, it is perfect for use on patios and terrace features, applications could include outdoor kitchen grills and fireplaces. In the garden, use it to face low retaining walls around planting beds and heritage trees. Indoors, Interior Designers and decorators love using natural stone veneers to add drama to transitional spaces such as foyers, hallways and landings, as well as for principle living areas. Surround a fireplace with Berkshire Stone Veneer, extending it to the ceiling and wall-to-wall for a feature wall that serves as focal point for entertaining and relaxing. Or use this product strategically in a powder room or on a shower surround in a master bath to create a spa-like oasis. Natural stone can be used in so many ways around the home, outdoors and in, adding organic beauty, character and real value to any style of architecture.